Innovative Bold Styling: UPR's new line of Valve Stem Caps are shaped like our Door Pins to give your ride that show car classy billet look. 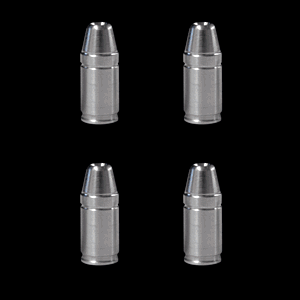 There are 5 different styles available: Stock, Regular, Designer, Bullet,and 9mm. We made these Valve Stem Caps to match our door pins exactly for anyone that likes to have multiple products that match each other on their ride. Quality Construction: Machined from 6061-T6 Billet Aluminum to give you the highest quality finished product available. No one else gives you the bold clean styling of our Aftermarket Dress Ups, Suspension and Performance Parts for your American Muscle Car like UPR Products! Installs in 5 minutes or less. Fits these Vehicles: 1979 1980 1981 1982 1983 1984 1985 1986 1987 1988 1989 1990 1991 1992 1993 1994 1995 1996 1997 1998 1999 2000 2001 2002 2003 2004 2005 2006 2007 2008 2009 2010 2011 2012 2013 2014 V8 V6 GT Cobra Mach 1 Bullitt Mustang Steeda Roush & Saleen Vehicles. Fits most Domestic Import cars, trucks, SUVs, motorcycles, bikes. Made in the USA!